This time last year, I started walking toward Canada on the PCT. I walked into camp that first night with as much dignity as I could muster, wondering if maybe I should have stopped at the 15-mile mark that day rather than getting all ambitious and shooting for the Lake Morena Campground at mile 20. I was shocked to find that people were there cheering for me and awaiting me with a plethora of beers and random foods. My first trail magic! The term “trail magic” refers to the unexpected acts of kindness and generosity toward hikers on and off trail, while “trail angels” refers to the lovely souls that perform these acts. Trail magic comes in many forms, such as a cooler filled with food left on trail, a water cache — or even a full-scale cookout, to name a few. As I indulged in their food I found myself suddenly emotional at the gravity of it all — starting the trail, being treated like royalty by these kind strangers at camp, etc. — and turned away to control the involuntary tears that were starting to well up. Want to make a thru-hiker cry? Give them a boiled egg and a cold domestic beer, apparently. The beauty of life on trail is that you can be having the worst day, and then you round a corner to find a smiling stranger telling you you’re awesome and handing you a cold soda. Everyone on trail has a fond memory of an especially kind trail angel, or of a trail magic encounter that was particularly clutch — the unexpected bottle of water when they were low on a dry stretch, the candy bar to add to a greatly diminished food supply, the offer for a ride to the nearest town. Trail angels make the thru-hiker world go ‘round. With the help of some fellow thru-hikers, I compiled a list of the trail magic spots that had the greatest impact on us while on our hikes. If you live near these areas or have plans to visit, and would like to bring some extra goodies or throw in a helping hand to PCT thru-hikers, here are some of the places where setting up trail magic could be incredibly beneficial. Trail magic is not expected. No one owes a PCT hiker food or water, and the spontaneity of it all is what keeps it magical. PCT hikers, don’t take these acts of service for granted, or try to make plans based on it. Just let it happen, and be grateful. This list is by no means exclusive. These are places that I have kept mental tabs of for my plans of being a trail angel in the future, as well as places that had particularly memorable trail magic moments. At the end of the day, all acts of trail magic are absolutely wonderful and appreciated, regardless of their location. Follow Leave No Trace principles. Plan for proper trash disposal and don’t leave entire coolers of food and drinks to go to waste — otherwise an act of well-intentioned magic becomes another issue of on-trail pollution. You won’t see nearly as many SOBO hikers. Chances to interact with SOBO hikers will likely be few and far between, as it is a significantly smaller crowd and thus it is harder to catch handfuls of hikers at a time. Don’t be too disappointed if you show up at the estimated ideal timeframe and end up not seeing anyone, as doing trail magic for SOBO’s can be a bit more of a wild card. Keep an eye on fire closures near the trail. In bad years hikers get stranded at relatively remote areas and struggle to find rides around new fire closures. Last year a first-time trail angel named Mama G hosted hundreds of hikers in her backyard and organized rides around the closures in Washington. She will be remembered and loved by many members of the PCT Class of 2017 for her kindness. This sort of trail magic is unplanned, but just as important and appreciated as any other. Hiking the trail? Perform trail magic for each other. Some of my favorite moments on trail include the times a few of us carried sodas for a fellow hiker. The look on his face every time we surprised him with a random Diet Coke on trail made carrying the extra ounces worth it. One time I got surprised on trail by friends who had hiked ahead, hitched to town, and brought back beers for everyone. Another time a trail friend had a birthday, and a few people carried in party favors and an entire pack of Birthday Cake Oreos to surprise her. Make your own magic; it will make your day. The NOBO descent from Fuller Ridge to Interstate 10 near Cabazon, CA, is long, hot, and monotonous. For SOBO hikers it is even more brutal, as they have to climb nearly 9,500 feet of elevation to get from I-10 to San Jacinto Peak. This is a dry stretch as well, with reliable water sources nearly 20 miles apart. Imagine the look on SOBO hikers’ faces as they look up from their brutal climb to see you holding an ice cold bottle of water and some snacks. You should also consider stationing yourself under the I-10 bridge at mile 210 to give hikers rides in and out of Cabazon — to and from the In N’ Out there, to be more specific. You could make a hiker’s day by giving them unexpected access to some good comfort food, and you could get the ultimate experience of watching a hungry hiker devour an overwhelming amount of food. It’s a win-win, really. This road-walking stretch outside of Palmdale, CA, is infamous for its astounding levels of heat and relative lack of water, not to mention it reaches an entirely new level of boring. There are, however, plenty of backroads for car access, making it a great spot for trail angels to drop by. Thanks to some really cool people who facilitated trail magic, I had an unexpectedly awesome day here on a stretch that I expected to be filled with misery. Walker Pass is located along the home stretch from Tehachapi to Kennedy Meadows—a section where you’re technically about to enter the Sierra Nevada, but the heat and waterless stretches sure don’t make you feel like it. The campground is located beside Highway 178, making it easily accessible for day users. You will more than likely find a handful of dehydrated and hot hikers lying under trees and waiting until the late afternoon for the day’s heat to subside—making them perfect targets for some trail magic deeds. 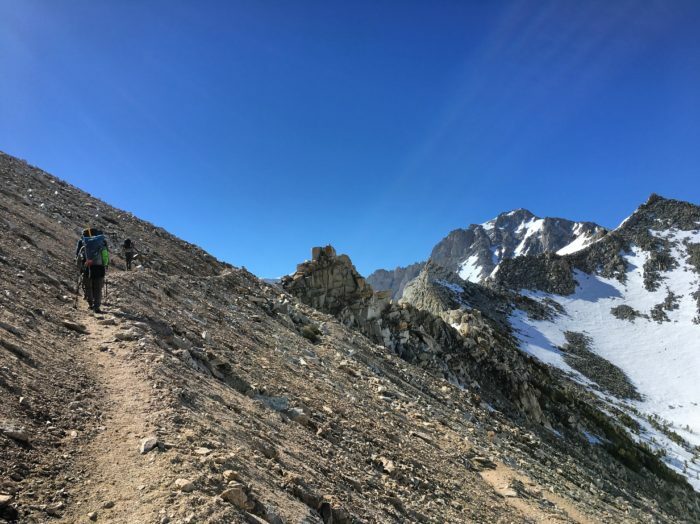 Many hikers exit the Sierra out of Kearsarge Pass, and descend down to Onion Valley Campground with hopes to hitch a ride into Independence, CA. This is a great spot to car camp and spend the weekend, so if you’re into providing magic and find yourself heading up here, you might want to pack some extra food. Be prepared for hikers to approach you as you leave, asking if you might have extra space in your car for a ride to town. One day just north of Sierra City, CA, a crew of us were taking a lunch break by a Forest Service road when a Jeep drove by, stopped, and backed up to us. The driver got out and pulled four Sierra Nevada Pale Ales and half of a Subway sandwich out of his trunk. We all shared the beers and devoured that half-sub in the most respectful way possible. Serious lunch upgrade. This area is a beautiful spot for recreation, with a handful of Forest Service roads granting access to it. Bring extra food and water if you feel so inclined to do some magic, because chances are you will run into a hiker that just finished the climb out of Sierra City and would love that extra half of a Subway sandwich that you didn’t finish eating. Belden, CA is just the right amount of weird for anyone looking for a good and slightly strange time. Its busy summer festival season makes it so there is a festival for anyone and everyone. Find one that appeals to you and go. The PCT runs through this unincorporated town and straight back up the mountains flanking its borders. Chances are you will interact with handfuls of PCT hikers who are just as excited (or weirded out, depending on the week) about the festivals as you are. Just north of Old Station, CA, Hat Creek Rim is scorchingly hot and exposed, and it’s one of the longest dry stretches on trail. If you’re looking to have trail magic so good you potentially make a thru-hiker run to you crying with joy, look no further. I spent most of the day daydreaming about ice cubes. I packed as much water as I could carry and still managed to run out and panic a little bit. If you don’t want to be covered in dust from the hugs of the grateful thru-hikers you will meet, this probably isn’t the trail magic spot for you. With its gorgeous views Hat Creek Rim is a great spot for day recreation, and is easily accessible by Forest Service roads. Olallie Lake is a popular stop for hikers, as it is a beautiful resort with a general store and good views. This is a great spot to throw some trail magic in with an outdoor vacation, and to hang out with some dirty thru-hikers. The PCT crosses over Washington Highway 410 at Chinook Pass in the Cascades. It is a beautiful area in which to start a backpacking trip, or even just to hike in a few miles to camp at the nearby Sheep Lake. This area is relatively remote but easily accessible from the highway, making it a perfect spot to set up some trail magic for a day or two and get some hiking in. The energy at Rainy Pass is likely to be high and intense in the best way; you’re either serving magic to NOBO hikers who are about to be done with the trail, or SOBO hikers who are fresh and probably nursing their first blisters of the journey. The Rainy Pass trailhead is a popular start for day hikers and weekend backpackers as well, so you are likely to find yourself surrounded by fellow nature lovers and outdoor enthusiasts. Between the area’s liveliness and its close proximity to the northern terminus of the PCT, this is a great spot to come and hang out with thru-hikers for the day. Oh man. What an emotionally charged spot for trail magic. This is the last road before the Canadian border, and NOBO hikers who reach this spot only about have 30 miles left in their journey. Here you will probably find a few hikers who are on that final stretch to Canada, as well as some emotional ones who have reached the border, decided not to enter Canada, and hiked back to Harts Pass for a hitch out. You’ll see thru-hikers congratulating and reuniting with each other, giving out hugs and saying their see-you-later’s. If you come in July you’ll see some fresh and ready SOBO thru-hikers who are excited to start their journey. Harts Pass is a great time. You can call me Legs. I completed my first thru-hike on the PCT in 2017, officially caught the bug, and now spend my days navigating the real world and daydreaming excessively about how awesome the CDT would be this year. When I'm not hiking you can find me hiding amongst the ski bums of Telluride, Colorado. These are great suggestions. I would like to add Horseshoe Meadows, as many hikers do make their exit via Trails Pass to resupply at Lone Pine.